Be the first to share your favorite memory, photo or story of Brunhilt. This memorial page is dedicated for family, friends and future generations to celebrate the life of their loved one. 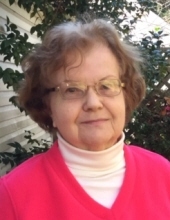 Brunhilt Gudrun Finerty (Bruni), age 83, of Lawrenceville, Georgia, passed away on March 27, 2019 of cancer. Bruni was born in Leipzig, Germany, on June 17, 1935 to Anna and Paul Knauer. She is survived by her children, Aileen Finerty Cox , Barbara Finerty Clark, and James Richard Finerty; by her son-in-law and her daughter-in-law, Roger Alan Cox and Melissa Lyvers Finerty; by her grandchildren Andrew Clifton Cox, James Alan Cox, Stephen Micheal Cox, Olivia Catherine Cox, Camille Shaffer, and Allyson Shaffer. Also surviving her are her brother Jochen Knauer and his wife, Erika, and other relatives and good friends in Germany. Also, surviving are her sister, Gertraude and husband Horst Neumann, and the Martin Jakisch family. Bruni loved her family and her friends with all of her heart. She enjoyed traveling, especially to the mountains and beaches and going to Europe. Her favorite hobbies included reading, gardening and birdwatching. She delighted in all types of music as well as the theater and symphony. She loved all animals, and had a special place in her heart for terriers and Rottweilers. Her kindness, generousity, sharp wit and intellectual curiosity will be missed by all who loved her. To send flowers or a remembrance gift to the family of Brunhilt G. Finerty, please visit our Tribute Store. "Email Address" would like to share the life celebration of Brunhilt G. Finerty. Click on the "link" to go to share a favorite memory or leave a condolence message for the family.